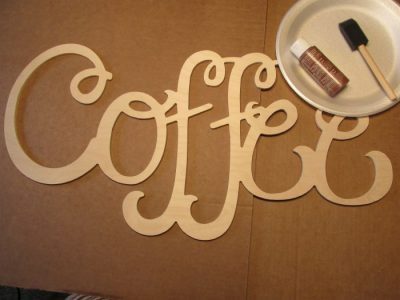 This cute and unique DIY wooden Coffee sign goes good with just about any decor. This simple and easy to make project can spruce up just about any place in your home. I have an empty spot in my kitchen that it can go and make it feel complete. 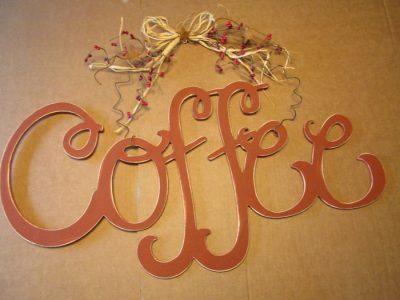 I painted my coffee sign barn red (please note the cardboard changed the color. The last image shows the color much better!). 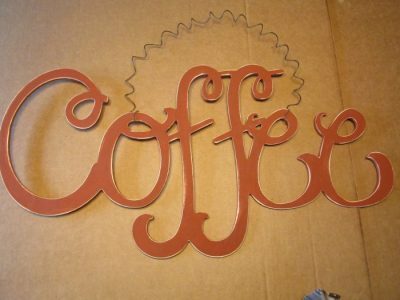 I painted this sign with three coats of paint, lightly sanding and wiping with a slightly damp paper towel between each coat. 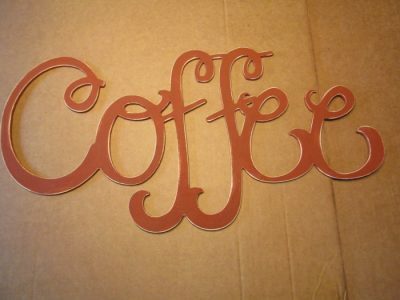 I want this sign to have a distresses primitive look to it, so I sanded all the edges with a coarse grit sandpaper. I also scuffed up the face of the sign with the sandpaper to give it an old look. 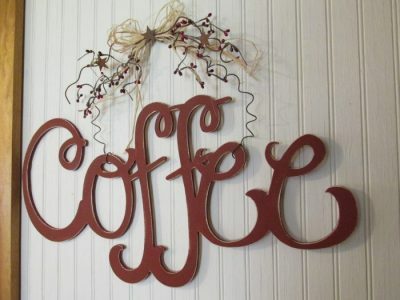 After the sign is distressed decide how you want to hang it. You could hang it as it is with an adhesive hanger, or just hang it on a small nail. I decided to hang mine on a wire so I could embellish it to match my kitchen. I don’t like plain wire, I like it to be kind of curly. 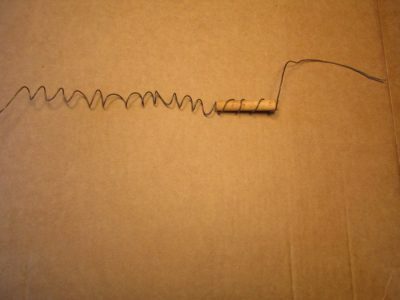 Take about four feet of heavy duty wire and loop it around something round such as a piece of dowel. I just wrapped the ends of the wire around my sign. 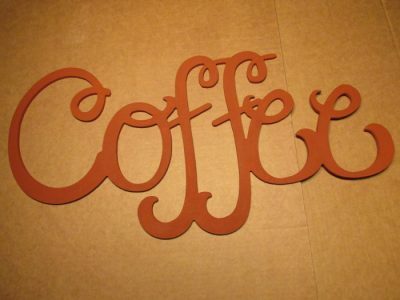 You could drill two holes in the sign, one at each end, to put the wire though and then curl the ends of the wire. But wrapping the wire around the sign will hold just fine. I wound some pip berries around the wire and wrapped the ends with a raffia bow. I took a piece of rusty tin wire with three stars on it and glued the middle star to the center of the bow. I curled the berry stems and the wire on the stars. 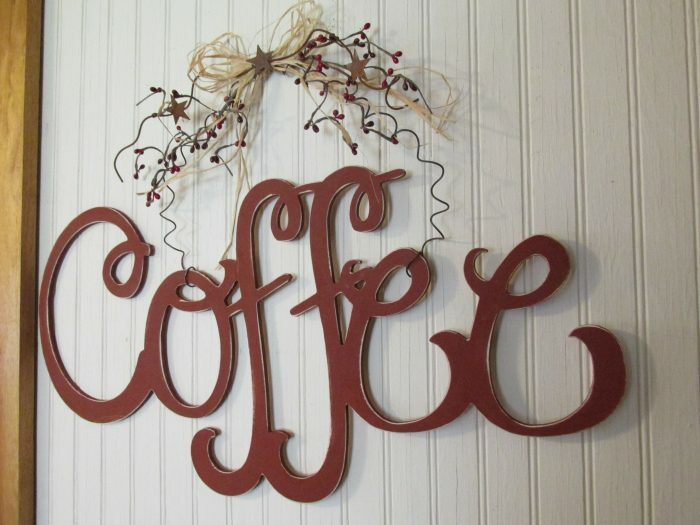 And here is my coffee sign hanging in my kitchen.